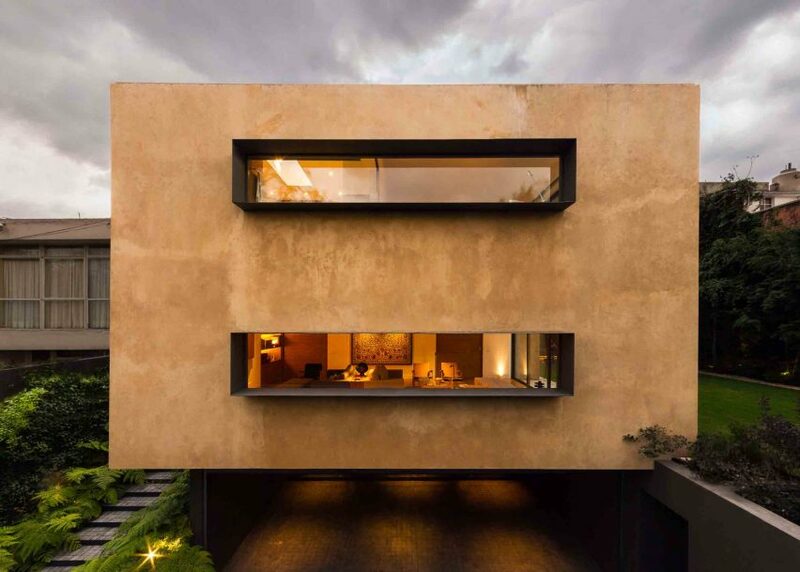 The black frames of two panoramic windows protrude from one wing of this clay-covered house in Mexico City, which extends over a sloping driveway to shelter a parking space. Mexican architect Andres Stebelski designed the 500-square-metre family residence for a for a square plot of land, which he split in two to create a garden in the southern half of the plot. Carpinos House is placed on the other side of the site, which features a level drop. 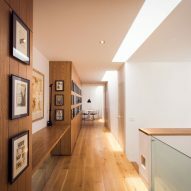 This prompted Stebelski to elevate one end of the residence so that it extends above the lower level, making room for a car parking space and storage. 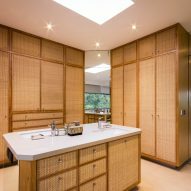 "Taking advantage of the topography, the parking area and storage spaces became the base or pedestal from which the main body of the house rises in the shape of a cube," explained the architect, who completed the project in 2014. A fern-flanked staircase runs up the side of the residence, leading from the garage to the main entrance, and mirrors the plant-covered wall that marks the boundary of the garden. 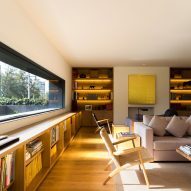 The pair of long and thin windows at the front of the house offer glimpses of a nearby wooded area, but are wrapped by protruding black frames that provide a degree of privacy from passersby. 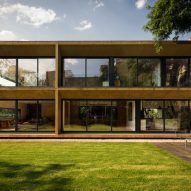 On the southern side of the house that faces the garden features large expanse of glazing, which open the two floors to views of the garden and plenty of natural light. 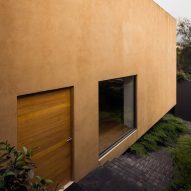 As these big windows light up at night time, the tones are complemented by the hues of the warm and textured clay exterior. Unlike the openings at the front, these windows are embedded in the wall to create a crucifix-shaped frame that encloses four sheltered terraces. The upper level is fronted by glass screens. The external structure segments the interior spaces. At ground level, it divides the lounge on the eastern side from the dining room and kitchen areas on the other. On the first floor, it partitions the master bedroom from the smaller three. 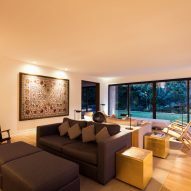 Inside, the house is finished simply with wooden flooring and white-painted walls. 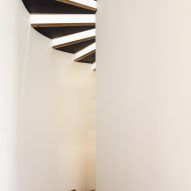 Other details include a staircase with wooden treads and open risers. 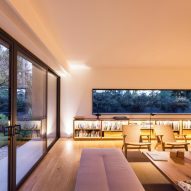 Other residential projects in Mexico's capital city include a concrete home with glazed walls that fully open to the outdoors and a property elevated off the ground to allow plants to grow underneath. Photography is by Nasser Malek.